It is good to be able to end 2017 with some good news concerning Pacific Northwest fisheries. Apparently the Pacific Ocean heatwave that cooked our steelhead and salmon for the past several years has officially ended. In an article by Marc Davis, in the January 2017 Salmon Trout Steelheader magazine: "The Blob is now gone due to a very active north Pacific weather year but it remained in place for two and a half years dramatically affecting all forms of marine life detrimentally." He explained that the exceptionally warm water that had plagued our Pacific salmon/steelhead feeding grounds had been replace by normal cold water. The picture above was acquired July 1-31, 2015. 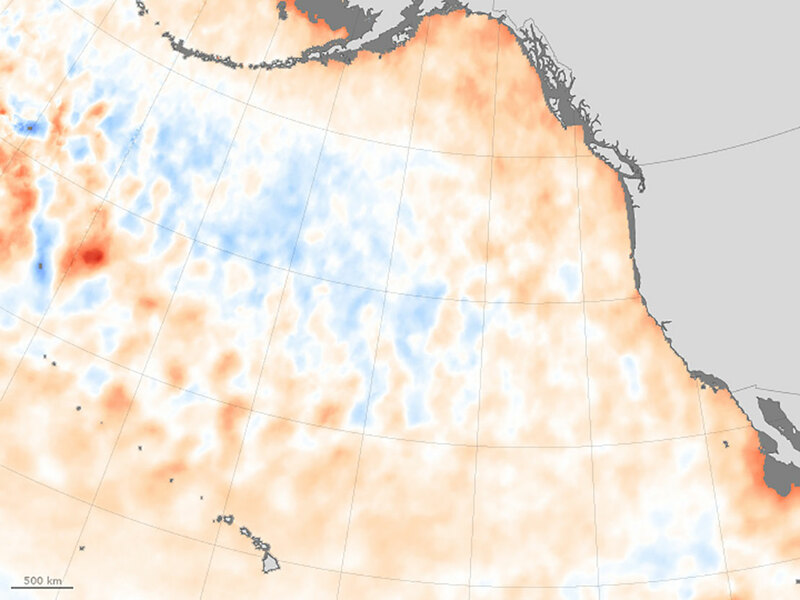 It shows a heatwave in the Gulf of Alaska, with Ocean temperatures as much as 6-degrees higher than normal. In the winter of 2013-14, an unusually strong and persistent ridge of atmospheric high pressure emerged in weather maps of the northeastern Pacific Ocean. This high pressure ridge slowed winds that usually help move nutrient rich water from the deep ocean to the surface where it mixes with oxygen and sunlight to fuel a food web that nurtures sport fish such as salmon and steelhead. 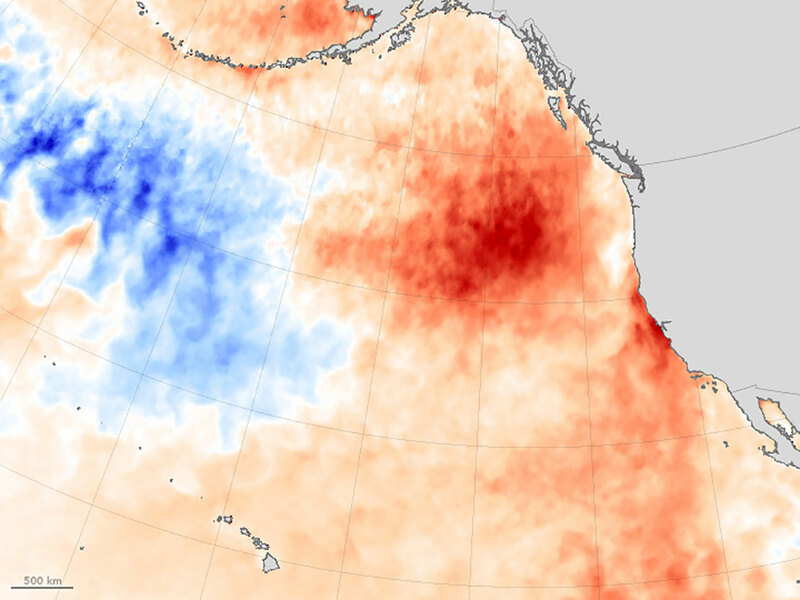 The stagnated ocean warmed to record levels. The food chain collapsed, and many sea birds, mammals and fish died of starvation. Salmon and steelhead runs in the Columbia River basin were especially badly impacted. So were revenues of shops and fishing guides that specialized in these anadromous fisheries. The Picture above was acquired January 1-31, 2016 as the blob of warm water dissipates. Apparently now the water that is rearing our fish in the Pacific has now cooled to below normal temperatures and is predicted to recreate a very strong food web. It will take time for food chain in the Pacific Ocean to get back what we would like to call normal. Fish runs in 2018 may be only a little better than in 2017, but there should be much better runs in 2019. The good times are coming back. According to the reports from our local biologists, fish runs in the Sandy River have been gaining all through the poor Ocean conditions caused by the Blob. It will be very interesting to know what will happen if we get really good Ocean survival. 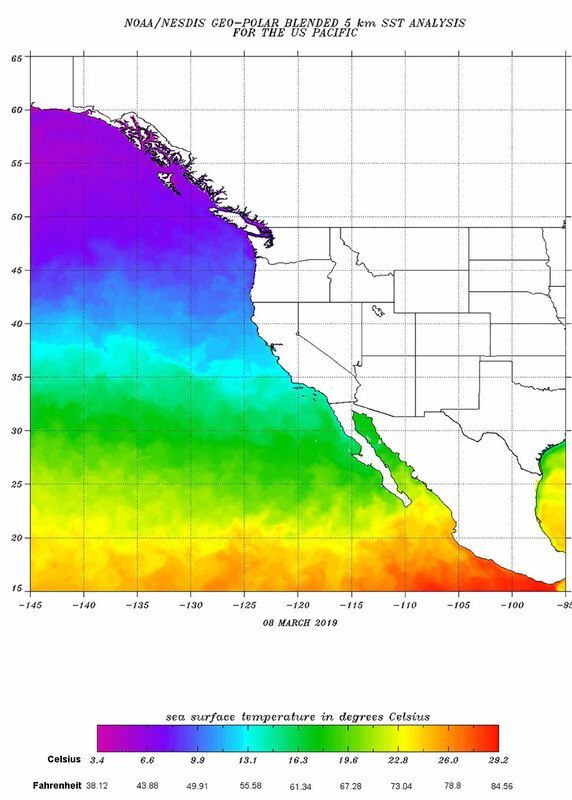 This Pacific Ocean temperature map (below) was copied from the NOAA site 03/09/2019. If the data are portrayed the same in all of these maps, then the temperatures have certainly changed from 2015. The fruitcakes of the world; like many steelhead guides are made from optimism. We always believe that you are going to hook a 20-pounder on your next cast, and that next year's run of fish is going to be stronger, and that tomorrow the water level and temperature is going to be perfect. One must maintain a stiff upper lip and keep your fly in the water.